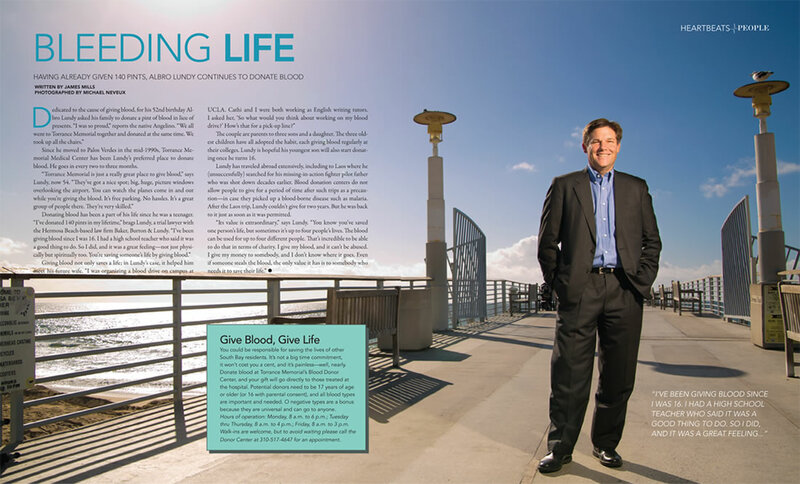 Since he moved to Palos Verdes in the mid-1990s, Torrance Memorial Medical Center has been Lundy’s preferred place to donate blood. He goes in every two to three months. The couple are parents to three sons and a daughter. The three oldest children have all adopted the habit, each giving blood regularly at their colleges. Lundy is hopeful his youngest son will also start donating once he turns 16. Lundy has traveled abroad extensively, including to Laos where he (unsuccessfully) searched for his missing-in-action fighter pilot father who was shot down decades earlier. Blood donation centers do not allow people to give for a period of time after such trips as a precaution—in case they picked up a blood-borne disease such as malaria. After the Laos trip, Lundy couldn’t give for two years. But he was back to it just as soon as it was permitted.